Author Jane Austen was virtually blind at the end of her life possibly as a result of arsenic poisoning, experts have revealed. Tests on three pairs of glasses held at the British Library showed the author's sight deteriorated considerably. At the time, heavy metals like arsenic were used in medicines that Austen, who had rheumatism, may have taken. Library experts have suggested such poisoning may also have contributed to her early death at the age of 41. The novelist, who lived in Steventon, Hampshire, died on 18 July 1817 and the cause of her death has been the subject of much speculation. 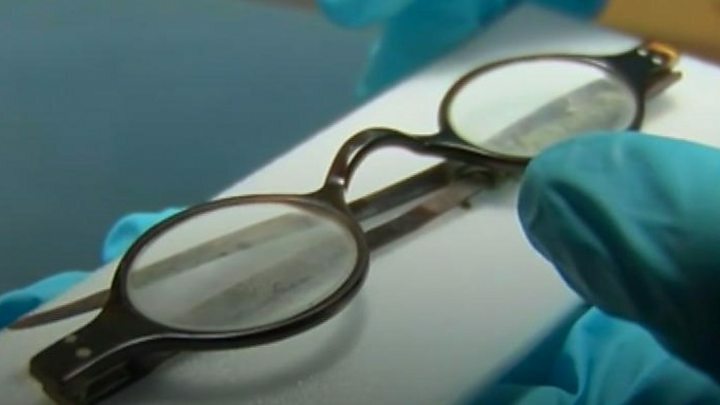 The three pairs of glasses, kept in the Pride and Prejudice author's writing desk, were examined using a portable lens meter brought to the library to determine the strength of the lenses which, despite their age, remain in good condition. Tests showed they increased in strength from +1.75 in each eye from the first pair to +4.75 and +5.0 in the final pair - meaning she would have found it very difficult to see well enough to read or write by the time she died. British Library curator Sandra Tuppen said: "There's the possibility of her being poisoned accidentally with a heavy metal such as arsenic. We know now that arsenic poisoning can cause cataracts. "Arsenic was often put into medication for other types of illness, potentially for rheumatism, which we know Jane Austen suffered from." It is not known whether the glasses, made of real tortoiseshell and glass, were prescribed for Austen or she bought them herself. The British Library is inviting optometrists to offer their opinions on the new theory.